Looking critically and analytically at vast amounts of sometimes disjointed information is an important part of any communicator’s job. As a visual communicator, I spend most of my time thinking through how to present complex ideas or topics in a clear, concise, and aesthetically compelling way. Nexight Communications Director Lindsay Pack has made the case for infographics and other visuals as integral to quality technical publications. As a designer, I am always on the look-out for inspiring work and new techniques that help me create graphics that present information more efficiently and beautifully. Here are a few examples of data visualization that inspire my work at Nexight. I’m not really a football fan. But I’m a huge fan of using unorthodox data sources to tell a story about demographics – in this case, in-migration in the United States. This map comes from Facebook’s Data Science Team. 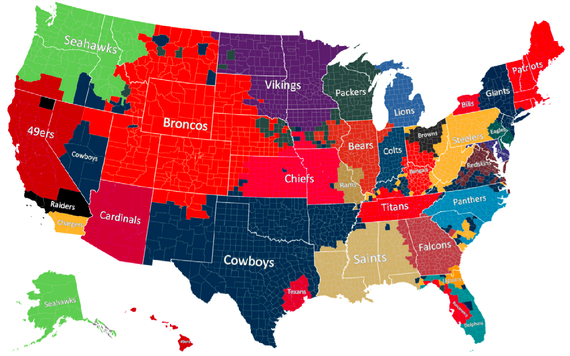 It takes all that detailed information you’ve been sharing with the social network service about your likes and location to create a map that goes beyond just telling us which NFL team is the favorite for a particular state. Firstly, you can make some conjectures about population density along the Eastern Seaboard. Secondly, a pattern of cultural regions and mega-regions emerges through the geographic distribution of fans. Finally, looking at the patchwork in much of the Sunbelt tells the story of how American populations have been shifting over the past few decades. 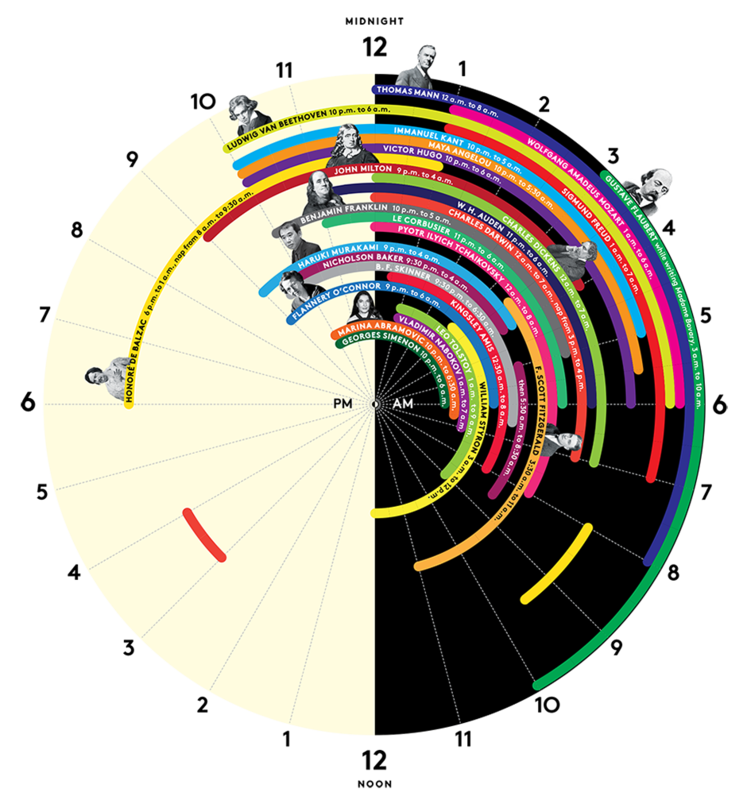 This graphic uses data from a book entitled Daily Rituals: How Artists Work, by Mason Curry, and skillfully incorporates vibrant color, portraits, and fun typography to create a clean, readable peek into the lives of some of history’s greatest artists. This is all made possible by using the easily recognizable analog clock face as a framework for thinking about literal periods of time. What jumps out is our sole night owl, Balzac, defying stereotypes and perhaps proving that it really does take a good night’s sleep to produce your best work. Flowing Data is a fantastic site with a variety of examples of data visualization, some complete with step-by-step coding instructions to create your own projects. 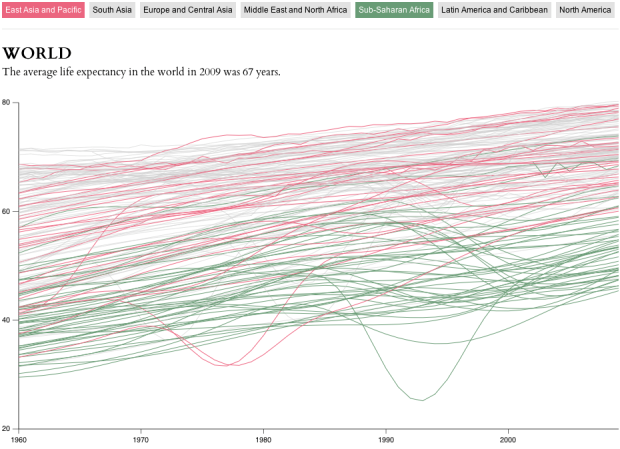 In this case, site owner Nathan Yau has taken country-by-country life expectancy data from the World Bank to create a simple but effective interactive graphic that demonstrates the overall trend toward longer lives. But it also shows the finely grained differences between countries and regions. I consider this graphic to be a great example of simplifying information through technology. On the site, users are able to control how the data is visualized based on his or her interests. It doesn’t really work as a static image though, so I encourage you to click through to experience the interactivity. It seems like data-driven maps get more interesting and beautiful with each U.S. election cycle. This series from The New York Times uses detailed result data from the 2014 mid-term election to create a series of state maps that manage to display county-level electoral data on user demand and highlight major trends all while taking on the appearance of an ethereal watercolor. What one takes from this series is dependent on individual interests. For me, as a both a recovering city planner and political staffer, I found the stark differences between urban and rural areas to be most compelling. However, sharp-eyed viewers will notice that the designer’s choice to highlight density as a variable makes this divide even starker visually. As with the Flowing Data example, these graphics are best experienced with full interactivity enabled on The New York Times website. Each of these examples presents information in a compelling way. In some cases, the look-and-feel takes a back seat to innovative ways of thinking about qualitative and quantitative data These examples also reflect Nexight’s overall visual communications philosophy, in which designers work alongside our writers and technical experts to develop high-impact graphics that present information clearly, accurately, and innovatively.